New CMS-driven website and design framework for Dunlap Industrial that uses a professional looking, clean design & a mobile/tablet/browser friendly format. (Responsive design from a core template). New product/manufacturer pages & breadcrumb hierarchy so pages may contain more general manufacturer information (like this example - http://www.dunlapindustrial.com/dih_products_page.html, or in the case of specific Dunlap lines like this: http://www.dunlapindustrial.com/swivel_J&E_forged.html - we′d allow for pages to be broken out and contain tables of figured, PDFs or other supporting collateral. Template choices to be provided. (e.g. Main page/Sub-page/Call-to-Action/Contact pages) prior to content integration being implemented. Search Engine Optimization Framework & migration of all old links to new site equivalents. Assumes a Draft/Published status for staging changes prior to going live.. Integration into WordPress content management system w/ new design. Integration of any social media platforms or feeds (like/share) content. Email integration for all contact forms & management of submissions. Migration of any domain or update of DNS to help ensure a smooth transition. New Google XML sitemap and submission. Create a more visual impact piece (e.g. info graphic) that tells your story to users immediately as they visit the homepage. Additional work as requested on an agreed basis. (e.g. additional launch transition assistance). Total Cost: $9,900 + $39.99/month for hosting, security, backups and database..
Timeline – Sites like this average around 30 - 45 days of design & development time - with content changes often being the portion of the project that can take the most time if you are writing/editing new content. We can use existing content and but a better "polish" on it to help speed the project up. Set-up YOAST SEO plugin and teach Christianson staff about how content should be thought of and structured. Gather a list of key phrases (realistic) that client would like to rank on and test against the current content. Make additional content recommendations based on results. Monitor ranking changes for 30 days. SEO framework included in site development. * - any third-party stock photos may require a one-time license fee, typically $5 - $10 per photo credit – client may choose photos or provide existing images as needed. We are a full-service web design & development firm. 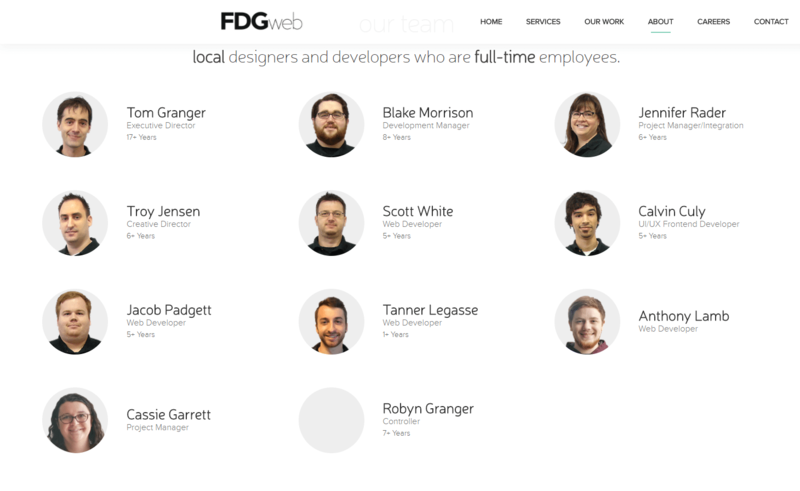 We have a full-time staff of local developers and designers here in the Seattle area in our office in Arlington, WA. No outsourcing or scrambling to hire people to do the work. "FDGweb was fantastic in taking our vision and making it into a website. We could not be more pleased of the work that they did for us and look forward to our next project together." "FDGweb exceeded our expectations when they upgraded our website from Joomla to WordPress. Their technical programmers are savvy with the latest technologies and easy to work with. Thanks to FDGweb we were able to get our new website hosted in only a few months." "FDG has been a key partner of ours from day 1 and I couldn’t imagine where we would be today if not for them. From an incredibly early stage, they assisted us across our entire technology stack by providing resources from their roster of talented specialists to accommodate our fluctuating demands. They provided us organizational agility that allowed us to meet our business needs in a way that would have otherwise been impossible without a fully-scaled development team, which was critical during the early stages of our growth."